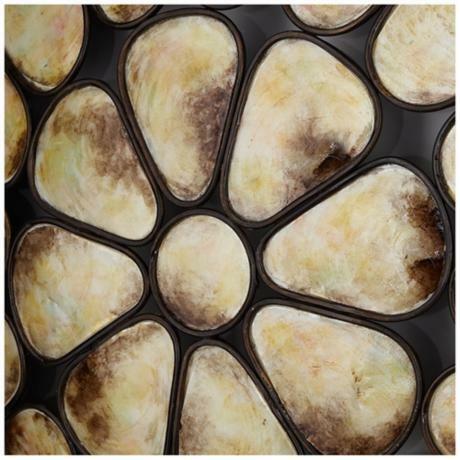 Enhance a wall in your home with this wonderful art created with finished metal and naturally beautiful capiz shell. Circles and ovals of thin metal tubing in bronze and champagne silver finish create the outer sections of this fabulous wall art. The middle consists of lacquered capiz shell surrounded by dark metal finish tubing. The rich, colorful hues of the iridescent capiz shells will shimmer, glisten and change depending on the light. • Metal frame in bronze and champagne silver finish.